I don’t know if this is good news or bad news, but I’ve decided to throw off the shackles of retirement and start full time work at the Education and Labor Committee in the House of Representatives tomorrow morning. That means that this will be my last regular Confined Space post. As I said in 2007 when I made a similar move to the Ed and Labor Committee, it is with regret and some sorrow to be wrapping things up here yet again. But the opportunity to help organize oversight hearings and investigations to ensure that OSHA, MSHA and NIOSH are executing the missions that Congress gave them and work on new legislation that will better protect workers is too much to resist in what we all hope and expect to be the last two years of the Trump administration. Now that we actually have our hands on some of the tools of power for the first time in two years, I’m anxious to stop just writing and tweeting about what’s wrong with this country and this administration, and start doing something about it again. Confined Space will remain on the internet for reference (as the earlier version did), and there may be occasional additions in the form of announcements or commemorations. Despite the rosy picture some try to paint, the state of working Americans is not good. More than 5,000 workers were killed in the workplace last year –14 every day — and almost 150 each day die from occupational disease — illnesses caused by exposure to asbestos, silica and other hazardous substances. In addition, employers reported that over 3.5 million workers suffered workplace injuries and illnesses in 2017, and those numbers are significantly underestimated. To enforce employers’ obligation to provide a safe workplace, we have tiny, underfunded workplace safety agencies that struggle to enforce the law while they are increasingly restricted in what protections the can issue and how those protections can be enforced. In 2018, there were only 1,821 inspectors to inspect the 9 million workplaces under OSHA’s jurisdiction. According to the AFL-CIO’s estimate, federal OSHA has enough inspectors to inspect workplaces only once every 158 years. OSHA now has fewer inspectors than any time in its almost 50 year history, despite the fact that the number of workplaces has more than doubled since 1975. The entire annual OSHA budget is around $550 million dollars while the cost of workplace injury and illness is estimated at $250 billion to $360 billion a year. And workers are finding it increasingly difficult to fight for themselves. Most workers in this country don’t have any significant voice at work. They don’t belong to unions and even the non-union organizations they are forming have come under attack by business groups and Republicans in Congress. Far too many workers are working full time, or at multiple jobs, without the ability to earn a living wage. Meanwhile, the lack of unions, the increasingly fissured workplace and mandatory arbitration agreements prevent workers from defending themselves against abuse by unscrupulous employers. We have a National Labor Relations Board that, instead of defending workers’ right to organize, is increasingly hostile to workers’ rights. And we have government enforcement agencies that, instead of protecting workers as Congress mandated them to do, are actually taking protections away. On the bright side, however, we’ve seen how teachers and others can make progress by uniting together and acting through strikes and political action to improve their working conditions and the lives of those they serve. One of the most frequent criticisms I’ve had is that I politicize health and safety too much. We know what makes workplaces safe. Most employers want to do the right thing. Take the politics and acrimony out and everything will be fine. Right? Would that that were true! It’s now been almost 50 years since Congress passed, and President Nixon signed, a radical new law promising safe and healthful working conditions for working men and women. For the first time, workers had the right to come home safety at the end of the day, and the right to participate in ensuring the safety of their workplaces, and an federal government agency to help them enforce that right. Yet, there are still far too many health and safety professionals who don’t understand that to a very great extent, who lives and who dies in the workplace is determined by politics – both power relationships in the workplace itself, and traditional politics that determines who controls our government, how much funding OSHA, MSHA or NIOSH receive, and the almost impossible legal and administrative hurdles that agencies must overcome to issue a simple, common-sense regulatory protection. While workers remain insufficiently protected from hazards like workplace violence, infectious diseases, oil and gas extraction hazards, combustible dust, musculoskeletal disorders and many more, the Trump administration, like other Republican administrations, boasts proudly of repealing “job killing regulations” and “regulatory reform” — cruel euphemisms for taking life-saving protections away from workers, consumers and the environment. The solution to these problems are as simple as it is difficult: educating Americans, organizing workers and electing politicians who will fight against unlimited corporate control over our workplaces, our environment and our regulatory agencies. What we’ve seen over the past two years at OSHA is a regime that will sentence numerous construction and maritime workers to devastating illness and death from beryllium exposure just so that the small coal slag industry doesn’t lose customers, an administration that cynically hides behind the false flag of confidentiality to help companies hide the injuries and illnesses that their employees are suffering, an administration that employs job blackmail by giving workers the false choice between protecting their lives or preserving their jobs. We have an administration that disrespects our government by appointing the ignorant, tainted and corrupt — from the very top on down — to execute the laws of the country and spend taxpayer dollars, an administration that replaces science and scientific experts with partisan politics and corporate lobbyists for the chemical industry. We have an administration that, from the Office of Management and Budget down to the enforcement agencies, has undermined the integrity of the regulatory process and devalued the concept of evidence-based protections. We need to continue to remind workers that injuries, illnesses and deaths can be prevented, that an organized workforce is their best guarantee of a safe job. 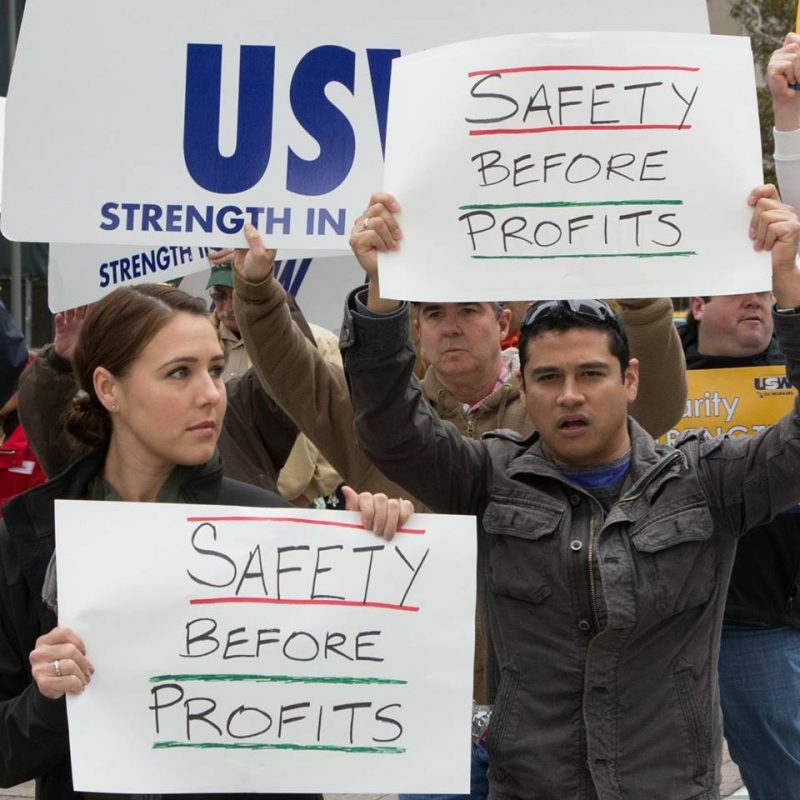 That a safe workplace is a right, not a privilege to be enjoyed only when the company is making a good profit. We need to make it clear that the right to a safe workplace wasn’t bestowed upon us by concerned politicians or employers who were finally convinced that “Safety Pays.” The right to a safe workplace was won only after a long and bitter fight by workers, unions and public health advocates. It was soaked in the blood of hundreds of thousands of coal miners, factory and construction workers. And the current movement to transform the agency into nothing but a coordinator of voluntary alliances is a betrayal of that promise and those lives. On a personal note, the past two years have been relaxing and invigorating. But also somewhat frustrating. Sometimes I feel like I’m just howling at the moon. Feels good, but the moon doesn’t really care and just keeps doing what the moon does. But if my writing here has been able to educate a few workers about their rights and the hazards they face on the job; if I’ve been able to explain how political involvement can mean the difference between life and death; if I’ve been able to provide some ideas and information to real journalists; and finally, if I’ve been able to provide a voice for the dead — for those many thousands killed every year in the workplace and their families and friends — then it’s all been worthwhile. I also want to thank all of the journalists out there who are so meaningfully writing about the reality of workers’ lives, for giving me things to write about, and for consulting with me about what’s happening at OSHA. You are America’s heroes. And believe it or not, I don’t think of everything myself. People call and send me stuff to write about. Without their help, I’d have much less to say. And finally, I want to thank all the career OSHA, MSHA, NIOSH, EPA and other career employees out there, working your asses off to help workers, even under one of the most unsupportive, anti-worker regimes we’ve seen in our lifetimes. Sometimes, I don’t know how you do it. But hang in there. Help is on the way. And one more thing. People are asking me how they’re going to keep up with what’s happening in the health and safety world without Confined Space. Well, a lot of what I write about is based on the work of the many real journalists out there who are writing about the struggles of working people. And most of these people are on Twitter. Although I won’t be blogging anymore, I will still be active on Twitter, ensuring that the good work out there doesn’t go unnoticed For those of you who are afraid of Twitter because the ravings or our President and his acolytes, never fear. You don’t actually have to participate. You can use Twitter as a news source without engaging in the blood sport. So follow me on Twitter (jbarab) and check out the other people that I follow as well. You never have to “tweet,” “comment” or “like” anything. Just lurk and read and learn. I can hear my contemporaries asking “Are you fu*king crazy?” Maybe. Can’t say I won’t miss my two year weekend or that I look forward to trudging to the Metro at the crack of dawn every morning — and believe it or not, even my wife, Jessie, says she will be sorry not to have me around the house — but if Nancy Pelosi can be Speaker of the House at age 78, I can help organize hearings, pass legislation and conduct oversight at the spry young age of 65. And finally, there’s this. In 2007, I shut down Confined Space to go work in the House of Representatives. Two years later Barack Obama was President. Coincidence? I think not. Will history repeat? With everyone’s hard work, I am confident. So, keep fighting. Keep raising hell. Keep hope alive. This too shall pass. And keep in touch. I’ll need your help to move a worker-oriented agenda forward in the halls of Congress. This time Pete has agreed to help out again. Because now, more than ever, we all have to decide which side we’re on…. Jordan, you and I are the same age.. old. But I too get out of the bed each morning and head for the train. Over the years I have been fighting the safety battle in the trenches. Some days are better than others. If I lived on the east coast instead of San Francisco I’m sure I would want to stand with you in the halls to help promote health and safety. Its beyond me why that after all these years after Nixon signed us in to law that companies and others are still trying to circumvent the safety and well being of others. Good luck in your future and although I am not a “tweeter” I will make an exception for you as I am very anxious to hear of your battles and accomplishments. Your parting thoughts beg the question: who does Jordan Barab endorse for POTUS in 2020? to continue your unequaled work on behalf of all workers. Thank you a thousand times over. Fight the good fight. And sweet dreams at night…..from one boomer to another. Good for you Jordan. It’s been a pleasure reading your blog and the information you’ve shared has been invaluable. I think you’ll be able to do more good for the American worker in the new position and actually envy you getting back into the thick of things. Not going to say goodbye since I know you’re only a tweet away. .Give them hell. Thank you Jordan! I have read your posts regularly and found them to be informative and well done. I will miss them. Good luck in your new position. We need people like you in that job! Thank you for your commitment. So well said, Jordan. You’ll be such an asset to those youngsters! And you know where to find us on the last Thursday of the month. Don’t be a stranger! Keep up the good fight. Solidarity Forever!!!! Jordan, I am sorry to learn you will not be publishing the list any longer – is there any way we can build in an alternate means of capturing the data? Congratulations, Jordan! Please don’t forget us locals when you resume your amazing efforts in the federal government. We hope to work together in the near term. Thanks again for this blog. It has been an invaluable resource over the past 4 years as we have entered the workplace safety enforcement space. Congratulation and best wishes on your new work. Thanks for your reporting, insight and passion for worker health and safety. I look forward to your third version of Confined Spaces, after your work on Capitol Hill is done. Thank you for your work with Confined Space. I finished schooling for EHS last year and have been using this site to educate myself further and stay up to date on EHS news. Good luck in your new position! Thank you for your blog. It has been informative, educational and helpful. I often use excerpts to teach employers and employees about hazards (especially that fatalities, as hard as they are to read). Best of luck in your new position. Congrats on the new opportunity! I really appreciated your take on safety in the workplace. Your knowledge of the various agencies really helped me to understand why some of the current administrations choices were so important. Unfortunately, even though important, they are not sensational so they got buried under all of the other “salacious/juicy/gossipy thing du jour” by the various media networks. Best wishes in the new position! I will miss your blog but I appreciate all the tremendous work you put into it. You have been raising awareness and saving lives, and now you will have even more impact in your new job. Thanks for all you do! Good luck. I know that you will put all your strength and knowledge into your new job. I will surely miss the blogs, the information, the rants. Sometimes, when I was so frustrated and disappointed that things are moving so slow – whether in politics or at our company – your blog gave me a renewed feeling of energy to keep going. I certainly miss your valued information already. I wish you the best. Your Weekly Death Toll, was an amazing compilation of the dangers that we must strive to mitigate and educate.